Lightweight Wool Anthracite There are 8 products. Corbara Professional Wear: front office garments in Anthracite Grey for high class hotels. Products in a stylish Anthracite grey, the hotel reception uniforms found in this section are made in lightweight pure virgin wool: an elegant and comfortable four-season fabric. Apart from front office, these hotel uniforms can also be used by sales personnel and all hotel back office departments in general; furthermore, in more modern facilities the three piece suit with vest can easily replace the tuxedo for the Maitre. There are three models of jackets available: for the man the classic three-button Perugia Jacket, and for women the Verona Jacket long cut with four-buttons and Carrara Jacket, short with three buttons; in combination with these jackets there are Nettuno model men’s flat front trousers, the Rubino pant model for women and the Ametista skirt. For those who prefer the dress, there is the Messina Dress with short sleeves. 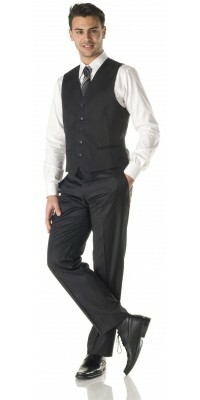 Lastly, the men’s vest mentioned above completes this series.